In March 2015 (AS49), I was warranted as Politarchopolis’ Baronial Chronicler, i.e. the communications officer responsible for designing, compiling and publishing the monthly newsletter, called Griffintayle. The newsletter had not been published for nearly four years, and I had been finding group newsletters to be invaluable resources in my time as Kingdom Historian (since they provide a snapshot in time and are not altered by the past/future), and so I was inspired to recreate Griffintayle in an entirely new design. In November 2016, this redesigned Griffintayle received a commendation for ‘Best Layout and Design’ in the Society-Wide Newsletter Awards for AS50. I began by searching for communications documents that would fit into period (i.e. pre-16th century), and found references to single page notices in the 16th century. It appears that, until the invention and proliferation of the printing press, written communication was in newsletter-like form. This makes sense, given that handwriting out copies of a document is inefficient and time consuming. It also presumes that the audience can read. Avisa Relation oder Zeitung (1609), published by Lucas Schulte in Wolfenbüttel (Germany). High-resolution digital copies of many issues of this newsletter are available online, published by Deutsches Textarchiv (DTA). Whilst not directly in the SCA period, the motifs and scripts used in both of these newsletters look, in my opinion, notionally similar enough to pass as an appropriate simile. As such, I used them as style influences for the redesign of Griffintayle. The headings of Relation and Avisa both had long sub-headings that described the purpose of the documents. As such, I named the document in this style: Griffintayle: Tayles and histories that have taken place in Politarchopolis, St Aldhelm, St Andronicus, and elsewhere in the kingdom of Lochac and the Knowne Worlde. (Later, it includes Torlyon in the title after the group becomes a Canton of Politarchopolis). No colour would be used. Even though this is unusual for a modern publication, my aim was to give the look and feel of something like Relation and Aviso. No websites or emails would be written out as the stand out like a sore thumb. Instead, all emails/weblinks were to be underlined (rather than the typical blue hyperlink style). Only woodcut and woodcut-style images would be used. As such, I spent time making black and white line drawings of the various officer badges, copied some of the page breaks in Relation and Aviso, and altered several of the woodcut images in Relation to be Baronial themed (e.g. by reworking them to include griffins). In order to get around not being able to use photographs in the document, photos could be uploaded to the Baronial website and then linked in text in the newsletter. Using advice from Mistress Joan Sutton and Master Crispin Sexi, I was able to download two fonts that are relatively consistent for the period the source newsletters were from: JSL Ancient for the majority of text and JSL Blackletter for fancy capitalisation. Using large tab indents for headings and the first line of text. Using forward slashes to break up some lines of text (instead of commas), as was done in some of the text in the source documents. In order to make the images used in Griffintayle look similar to woodcuts, I drew them in black ink before scanning them in to the computer for digital manipulation and publication. Some of the images are described and documented, below. Title Page. The cover of the redesigned Griffintayle newsletter is based on the cover of Relation, with several of the figures replaced with figures more relevant to the Barony. Specifically, the man on the left hand side of the border was replaced with a likeness I drew of Baron Crispin Sexi, the man on the right hand side of the border was replaced with a likeness of Baroness Joan Sutton, the cherubs along the bottom of the border were replaced with a griffin, and the anchor and heart on the shields at the bottom were replaced with the background of Politarchopolis’ device. 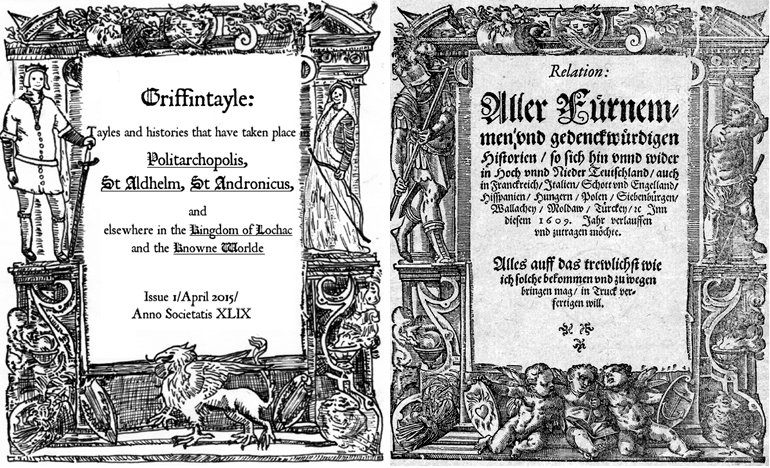 Griffintayle’s title page (left) drawn in ink by Ceara Shionnach compared with Relation’s title page (right) (sourced from Heidelberger historische Bestande). Page breaks. Several pages scattered throughout Relation and Aviso include decorative page break images. A page break in Griffintayle (left) drawn in ink by Ceara Shionnach compared with the source image from Relation (right) (sourced from Heidelberger historische Bestande). The primary difference between the motifs is that the face in the centre of Relation’s figure was replaced with a griffin’s face. A page break in Griffintayle (bottom) drawn in ink by Ceara Shionnach, copied from the source image from Relation (top) (sourced from Heidelberger historische Bestande). In terms of the content of the redesigned Griffintayle, I perused other Griffintayle editions, Pegasus (the Kingdom of Lochac’s monthly newsletter), and other SCA group newsletters to get inspiration. to provide a future resource for the history of the Barony. One of the regular sections in the document, called People of Politarchopolis, was instigated by the Town Crier Baroness Ginevra Lucia di Namoraza. It was inspired by the People of New York interview series, and involves Baroness Ginevra interviewing members of the Barony to share their experiences, thoughts, and interests with each other. Despite looking rather different to modern newsletters and announcements, I am pleased with the result of my redesign. To me, even though it isn’t exactly the same as the styles in the extant newsletters, it gives enough of the vibe of them to look periodesque. I’m also glad that it looks strikingly different from all other newsletters in Lochac, and that it has many personal touches for the Barony (line drawing images of the Baron and Baroness on the front cover, griffins throughout, People of Politarchopolis interviews of the populace, and information relevant to, and about, the Barony). Full issues of this redesigned Griffintayle are available on the Baronial website, starting with Griffintayle – Issue 1 – April 2015 (AS49).